Jennifer Singer is an architect and education design advisor. 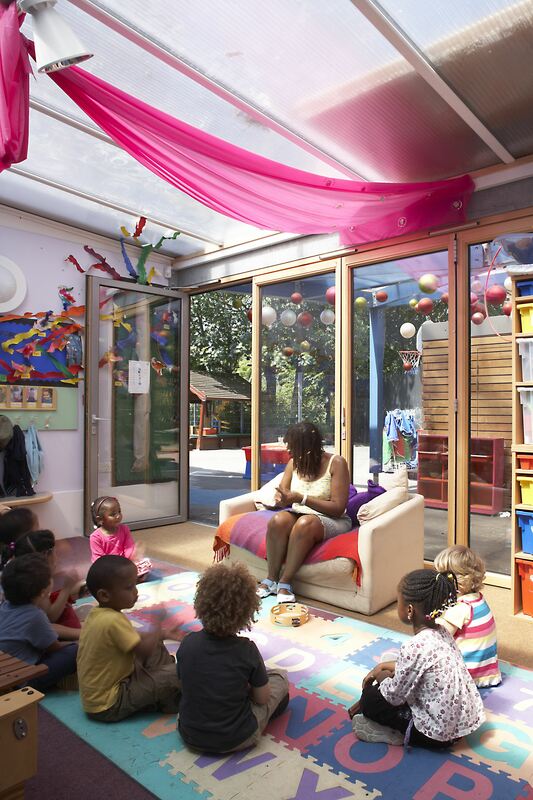 She has collaborated with students, teachers, parents, contractors, local authorities, government bodies, developers and others on the design of nurseries, primary schools and secondary schools throughout the UK. Originally from Philadelphia, USA, Jennifer is based in London. Tell me about an early school. I lived in a suburban area of Philadelphia and my elementary school was designed in the 1950s, as was every school in the area. It was three-form entry and it was a sprawling building but I don’t remember it feeling overwhelming, maybe because it was all built on one level. Every classroom had a door to the outside leading into the playground and that’s where we spent much of our time. Jarrettown elementary school, Philadelphia, USA. What were the classrooms like? I remember that all the classrooms had pin boards and there were blackboards too, the old-fashioned kind. The classrooms were always decorated really nicely, there were borders around the pin boards and it was quite a nice thing when your work or your drawings were up there. There was lots of built-in shelving, a sink-unit and a homely classroom environment. Did you have a book corner? The kindergarten had different elements in different parts of the room: a doll’s area, an area where you might present things and an art area so it was all compartmentalised. I remember books, but I don’t remember a book corner. There was a library and the architect had spent a lot of time designing it because it was very beautiful: round and faceted with an angular roof that brought light in from above. It was small, but it had different wings and we used to love to go into the little niches to pick out books. There were also views outside. So it was a little gem in this sprawling ‘50s building. There was: Mrs Graffius. She also had an assistant and they both were lovely. The library was a really important part of the school and we would all queue up to go there. It was a very special part of the day. We had specialist teachers. The music teacher had her own space and everything was decorated just right and it made it very personable and educational in its own right. This school had a lot of personality because the students’ work and murals lined the corridors. It was part of the ethos and spirit of the school. I felt that the school was very child-focused, and at a human scale. When you decided to study architecture, was any part of your training focused on schools? No, it wasn’t. It was a very broad training. My initial training was in the US before I came to the UK to study at the Architectural Association. 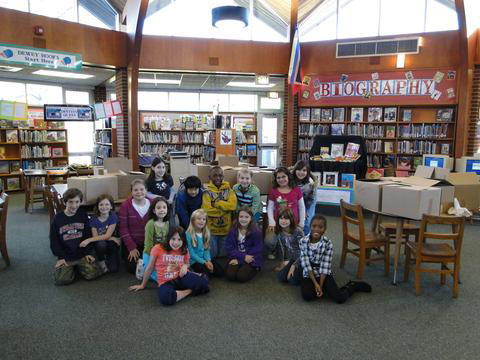 In the US you do a number of projects each year – some are group projects, some are individual projects. I studied in St Louis and designed a vocational school to be situated on the Mississippi River and that was really interesting because it was very different from the kind of school I went to myself. It was a fictional brief though, so there was no engagement with teachers or young people. The people at the other end, the critics, were architects and academics rather than people who would use it. What was your first professional engagement with school design? First, I worked for architects such as Daniel Libeskind and David Chipperfield and then moved to Greenhill Jenner Architects, who had built up a reputation for participation in schools, especially working with early years, and so while I was still training as an architectural assistant I began working on a Sure Start Children’s Centre. I felt a connection with this area. I’ve always felt passionate about school and education because my mother, my grandmother and most of the women in my family were trained teachers. So I’d grown up not only going to my own school but helping my mother in her school. She taught English as a second language in a primary school and I saw what life is like for a teacher close up. It’s a really hard job. But also I could see, through her and my grandmother, that it was a two-way street and how she was still in touch with a lot of her students after they’d left the school and even into retirement. So by going into school design, I was connecting with that. Plus, when I was younger I did want to be a teacher but I’m not patient enough. You trained in an architectural practice that was interested in participation with children. What did you do there? I started working with Alison Clark, an educational researcher, who at the time was working with the Institute of Education to develop the Mosaic Approach. She approached Greenhill Jenner because she wanted to see how schools and architects work together on design projects. The practice was successful in bidding for a new nursery for Ashmole Primary School and I worked with the school very closely and spent a lot of time there. The project evolved into not just a new nursery but a redesign of the existing school and shifting things around to make the school work better: it was much more holistic than just a £400K nursery building. Alison Clark and I worked together from the very beginning. She brought her approach in education to the project and I brought my approach as a designer. That project has had a major influence on me: on how I design; on my approach to working with clients, schools and young people; and now even on how I interact with my own children. It led me to see the context of school design beyond individual projects. Did it feel quite a pioneering approach to use participatory research with children in design? I didn’t know too much about the participation angle when I started. As far as I knew it was based on work that had been going on in the past but hadn’t been studied in depth. It was over ten years ago that I began working with Alison on Ashmole School. 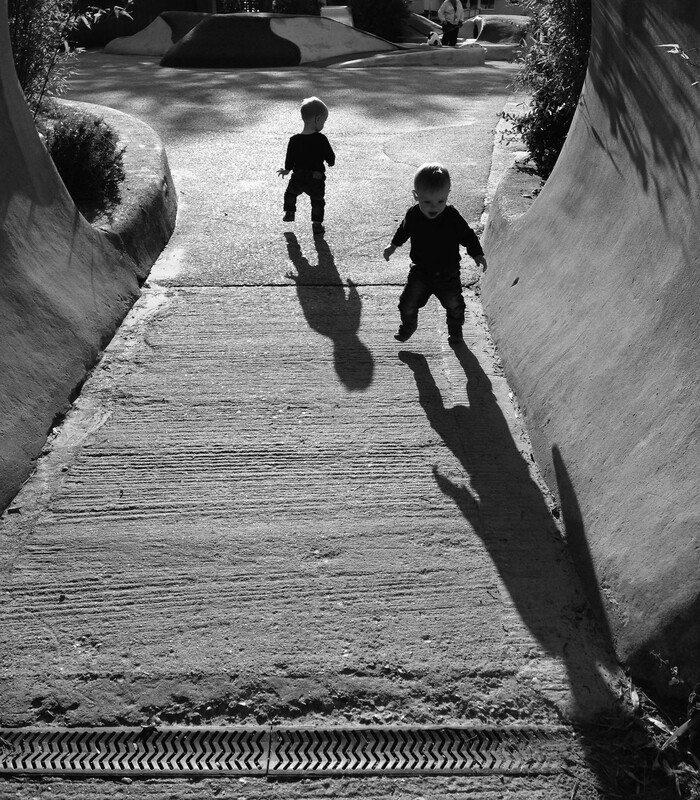 Greenhill Jenner Architects worked with schools in terms of participation but not in a formal methodological way, and that’s what Alison brought – using the methods of participation in a particular way to interpret children’s spaces. The Mosaic Approach is not about teaching children about design but understanding how they see things. In my view, when designing a child-centred environment, that’s more important than teaching children about design, which is a different area of study. Ashmole primary school new library. How can you involve children in design decisions if they don’t have sophisticated design skills? A lot of it was done through observation but Alison would also make little books with the children in the nursery and interview them about their everyday experiences. The question she put to them was, ‘What is important here?’ It may seem obvious to some people but actually it should always be the starting point of school design. These children were between three and five years old. They would come into the school reception area and they wouldn’t be able to see the school secretary, or whoever greeted them, because they couldn’t see over the reception desk. Sometimes certain places were important to them, like the bottom of the stairs, because that’s where they would meet an older sibling. Places like the pegs were important – seeing their own names gave a sense of identity and belonging. Just thinking about these moments in school design may seem ‘everyday’ but they are really important to the child’s journey. We started that project in 2004. Construction was completed in 2006 and there was a post-occupancy evaluation which Alison led. In 2010 we had the opportunity to go back to the same school and meet with the children who had originally participated in the project: they were about 10 or 11 years old by this time. We reviewed images from the study and the children talked about the things and places in their nursery that had been important to them. They still remembered those places, like the pegs, and talked about these aspects as if it were yesterday. It was so powerful for me to see how that had continued. Similarly the staff talked about how the experience influenced how they used their space differently or positioned things on the walls, by thinking about the child’s perspective. Ashmole primary school, foundation hub. 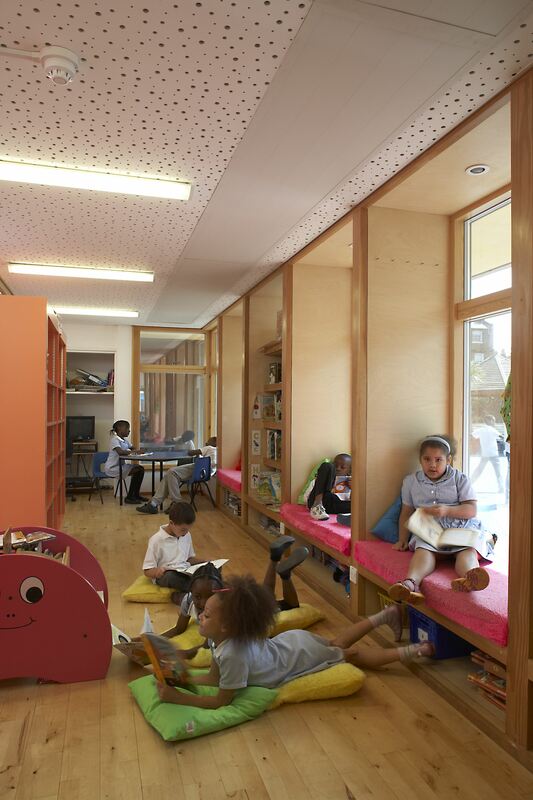 You can read more about the project in Transforming Children’s Spaces by Alison Clark. When I dropped my own children off for their first day at nursery, two weeks ago, and I saw the pegs in their school, it reminded me of those important moments in a child’s experience of their school and the impact that the child’s learning environment can have on their memory and perception of school. And has that influenced the way you work as an architect? It does: those moments do. Obviously there are lots of things I have to think about as an architect or as a client design advisor but at the end of the day we also have to think about the children and their experience. Sometimes we have to say ‘this is not quite right’ because you have to think about the personal as well as the generic aspects of school design and a textbook approach doesn’t suit all situations. Where did you work once that project had finished? 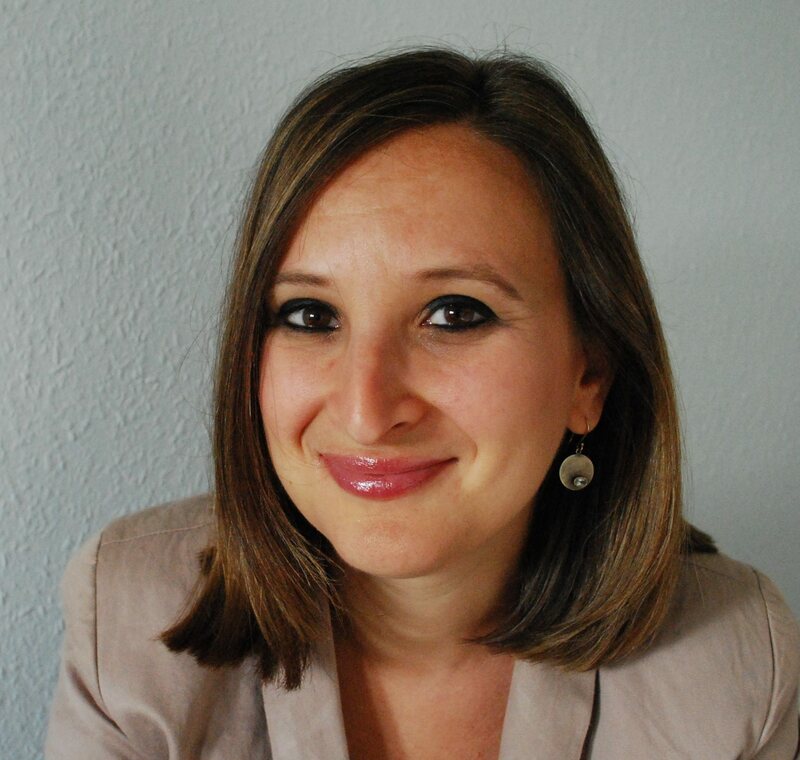 I worked as an architect as well as a client design advisor in schools; first in early years and primary schools and then in secondary schools before I had the opportunity to work at the Commission for Architecture and the Built Environment (CABE). In those days CABE was the government’s advisor on building design and my department was commissioned by Partnerships for Schools, the delivery body for Building Schools for the Future, to review BSF designs. I worked there for two years as an advisor on the schools design panel. Seeing the breadth of school design was very refreshing. The critical thing was to look at the lessons learned and what was happening in so many schools. When the school design panel was disbanded, after BSF ended, I continued as an independent education design advisor. Alison Clark introduced me to Pam Woolner, a lecturer in education at University of Newcastle who has a particular interest in learning environments. Pam was gathering together an interdisciplinary panel for a school design conference. I spoke about the key lessons learned at CABE and how these could apply to the next generation of schools that were emerging during ‘austerity’ including school refurbishments and free schools. Guy Claxton was there, Rosie Parnell (a leading academic in participation in school design), Alison Clark, Neil Gislason (an educationalist from Canada), and Geraint Franklin (a buildings historian) – all of these people were doing very different things in school design. Pam Woolner developed the idea of putting this together into a book called School Design Together It’s all about collaboration and looking at different perspectives, asking if it is possible to structure interdisciplinary school design as a discipline. We think there is a discipline in these intersecting areas of practice but also there needs to be a culture shift to embrace the opportunities and possibilities of a truly collaborative process. It is a real challenge. As a client design advisor I see lots of schools in the design process and the time-frame for procurement has been compressed from the days of BSF with funding more limited. Even with BSF, although there were lots of good ideas and aspirations for involving students and teachers in the design process, I don’t think it was always consistent across local authorities in terms of how the collaboration and participation was effectively realised. The sort of participation work that Alison Clark and I did couldn’t happen now on a larger scale. However, there needs to be some engagement, particularly a change process for schools, because otherwise what we’ll get is exactly the same sort of school that they’re working in now, but maybe a bit smaller or with slightly different classrooms. Schools do not necessarily think about what they want to do in the future. Because the time-frame for making decisions is short, schools have to make design decisions fairly quickly but we need to avoid the designs being based only on their existing situation and current experience. We need to help schools towards improving the way they teach and work and towards better engaging young people, children and communities – the design and use of the learning environment is an important mechanism to do this. Who is making those decisions? I work with schools, so when we go through the design process, the schools are involved. The challenge is that the overall design and building process can take a long time, and it is inevitable that people change jobs or things change operationally. So key decisions in the briefing process may be made by someone separate from the people involved in the later design stages or some aspects need to be revisited later. Others need to be involved to help achieve the right balance. School staff are very busy people and they probably don’t need to be involved in so much depth, but they do need to be involved in the long-term thinking. That’s what Pam Woolner and I were addressing in our joint chapter in School Design Together. It looks at the whole cycle of school design, and opportunities for collaboration within a dynamic and evolving process. Do you think teachers need more training in college about school design? I think so. It needs to be incorporated but maybe not necessarily in the way people might think, so not as a superficial process but how to use the built environment as a tool for learning and also how students and teachers can be engaged in it. Educational activities and operations are fundamentally linked with the school setting so it’s crucial to build a foundation for this. Do you think teachers value the spaces where they work? There have been a lot of research studies about the importance of the building in teacher retention. My mother taught in a classroom that didn’t have any windows and she was teaching children who came from other countries and who were learning English. Often these children lived in cramped conditions at home. Once they finally had the funding for a refurbishment she had quite a lot to say about what was needed. Fortunately, I haven’t seen any classrooms that are in such a bad condition. In the UK there is a real emphasis now on the environmental qualities of learning space (good daylight, ventilation etc.) and standards are continually being improved. We know that school buildings are important to improving concentration, motivating people and inspiring them. People presume that this is a maintenance issue but I do think that if teachers could use the spaces better, it would make for better, more pleasant teaching and working environments. First impressions and the image that a school projects is important, for example, if a school is in a poor state of decoration, has scuffs and peeling paint then it won’t be very appealing to the students, staff or visitors. Buildings are buildings at the end of the day and not everyone values architecture but it’s about using your space as a way of interacting and developing new and improved ideas about education. That’s what can get lost in this process: design should be a means rather than an end. It’s a way of thinking through complicated problems. Some local authorities and educational organisations have worked with schools to find out what could help teachers to teach better and support their communities better sometimes even two years before they went through the physical design process. It’s a very long process, but there are proven benefits when collaboration is integrated into the whole life cycle of the building. We’ve seen this with Hampshire County Council, for example. The educators, design team and maintenance people all work together. They have an ongoing relationship. That is the best model for bringing education together with the building. How could that way of working be reintroduced? People are talking about post-occupancy evaluation on a bigger scale now. Some of the unique projects that were cut are starting to happen again, even though their outcomes haven’t necessarily been formalised. The website Designing with children catalogues some examples. A continuity of intellectual knowledge and dialogue about school design and building is critical to put the ideas behind collaborative school design in practice. This seems to be happening at a number of levels now. Do you think that design can provoke useful questions about different models of education? Yes, it can be a way of testing models of education and how they can be worked out. It is a way of bringing different people around the table to engage in conversation and debate. This has to be the bottom line. The visual is a very powerful tool in exploring this as is discussed in School Design Together. If you could change one thing overnight about all schools, what would it be? It would be for the internal spaces and the external spaces to be connected together. That’s something that happens in early years and it can be expensive to achieve, but it’s something that seems to get lost as children get older, even though it is even more important for older children to have a sense of the outside. 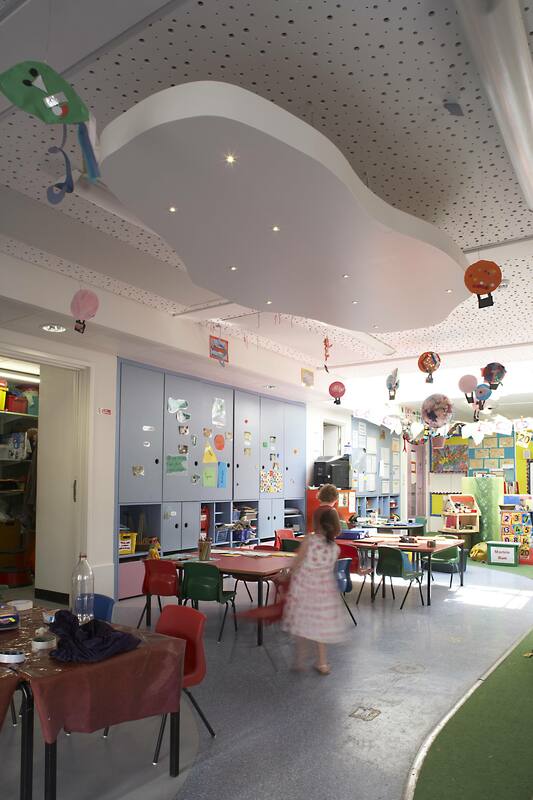 As children get older and their buildings are bigger, their school spaces can get more generic and institutionalised. When I took my children to the nursery for the first time, I loved the homeliness, the same things that Alison Clark and I talked about and I’d love to see that permeate all the way through a child’s education. Education is a personal thing and you should feel comfortable where you are because if you’re comfortable, you’re confident, and that’s what we want: confident learners. Photograph: Jon Exley, September 2015. When architects talk to teachers, what should they talk about to achieve a shared understanding? We need to learn to listen better to each other. That would be the starting point: to learn how to listen. Once you start to talk and discuss and debate things you can get a better idea of what the other one needs. And I think what Rosie Parnell is doing with participatory design research is really interesting: she looks at when participation happens. You can talk and listen, but when you participate, when you get that ‘aha’ moment of understanding, you can help each other and vice versa. Do you think school buildings will still exist in fifty years time? I like to think so. Having a place where you can physically be together and talk about things and look at each other is important. I know a lot of people who do online courses, but are they the kind of places that you want to inspire you? I don’t think they inspire you at all, in fact I find them technically quite difficult. Maybe schools will look like they do now, maybe they will be in a different type of building but I believe they will have a space. School is a fundamental part of many civilisations and it’s the act of getting together and learning from each other that is vital.